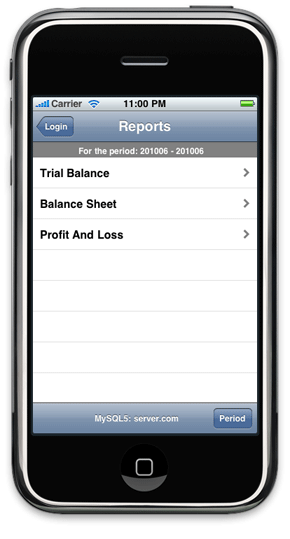 Luca for the iPhone allows Luca Accounting users to access a subset of their data, like Trial Balance, Profit & Loss and Balance Sheet reports from the iPhone, if their database is stored in MySQL or PostgreSQL. It's a free download. 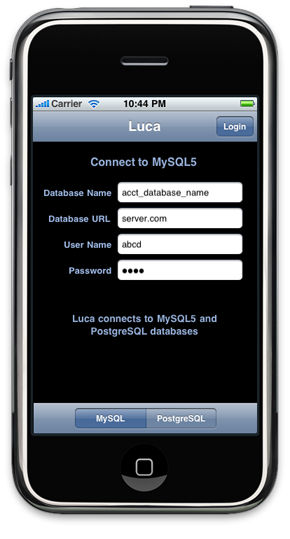 Choose either MySQL or PostgreSQL, enter the connection parameters and tap the Login button. 2. List of Reports. 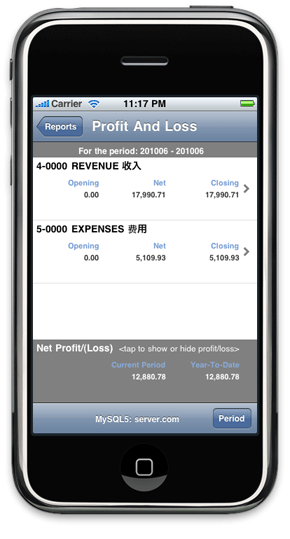 Select the Trial Balance, Balance Sheet or Profit & Loss report by tapping on it. 3. Trial Balance. 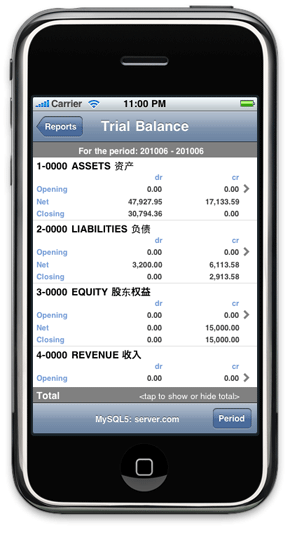 This shows how the Trial Balance report will look like on iPhone. It handles text in any language. 4. Drill-Down to the Sub-Accounts. 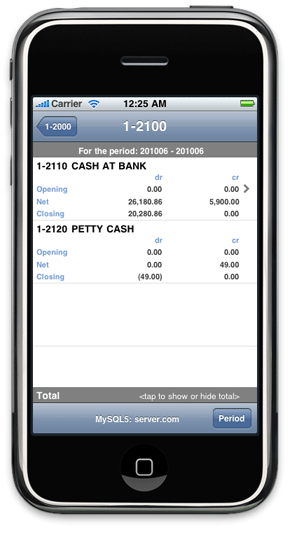 Just tap on the disclosure buttons on the right to drill down into accounts which have sub-accounts. 5. Show or Hide Totals. 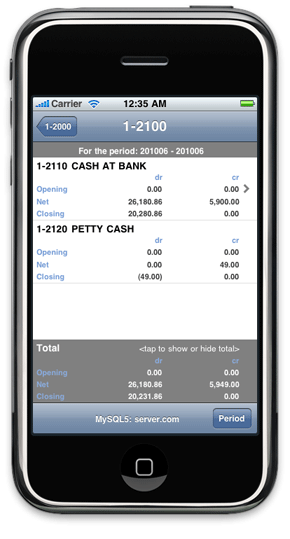 You can choose to show or hide the report's totals by tapping the "Total" bar at the bottom of the screen. 6. Setting the Reporting Period. 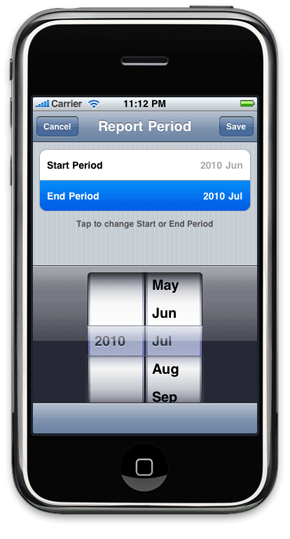 Tap the Period button at the bottom of each report to change Start/End dates for the reporting period. This is how the Balance Sheet looks like on iPhone. The Net Profit or Loss figures are at the bottom. 8. Profit and Loss. This is the Profit & Loss report. Totals at the bottom, and you can drill down to the sub-accounts. 9. Connecting to PostgreSQL. 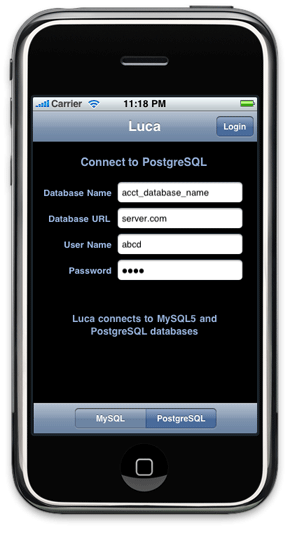 If you've stored your accounts in PostgreSQL, Luca for iPhone work the same for you.